OUR PRICE: $163.20 - Join Rewards Get $16 Dance Dollars On This Item! Bloch's professional tap shoe designed with tap icon Jason Samuels Smith. Leather upper lined with Kashmir to reduce moisture. Double hard leather outsole with triple stacked heel. Steel resonance plates between tap and outsole create optimum depth and pitch of sound. Specially developed metal bonding procedures ensure that screws will not loosen without modification. Heel measures 1.5". Separate slip pad included. Very disappointed. My daughter needed them for competition and I ordered a size larger as per sizing notes, but the shoes are extremely small. She couldn't get her foot into the 8.5 and she is usually an 8. Had to return and we did not have the shoes for the event. I ordered 1 size larger for my daughter as recommended and they were STILL too small! Her other style Bloch's are a half size smaller and are actually BIGGER than these. This style is an odd fit, so try on if you can or you'll spend more shipping them back! Good quality, heavy tap shoe. Takes some time to get used to the feel as well. Produces great sounds. I bought my second pair of JSams last week because I needed comfortable black tap shoe for performances (my first pair is white). I've danced almost exclusively in my white ones for over a year and I was able to dance in them right out of the box. . I've tried a few other types (Bloch split sole, Leo's, less expensive Bloch taps, and K360s) and nothing beats the JSams for comfort and sound. . I have bunions also, which is a huge concern for me with tap shoes. The front of the shoe is sometimes narrow for a snug fit (for obvious reasons) but for those of us with bunions, the pain can be unbearable. With the JSams wider style, padded ankle area, cushioned insole and lower heel, it's a perfect combo for me. . I also love a deep bass sound in the heel and it's absolutely fabulous. I get many compliments on the sound of this shoe due to the taps' rich sound. . I wear a solid size 8 street shoe. I got a 9 in my white ones as recommended by Bloch and they ended up slightly large. I added a Achilles heel pad which helped a lot. I decided to get an 8.5 in my black ones and they are comfortably snug. With this particular leather, they will stretch a bit after use. I'd recommend a half size up for women, especially if you don't have bunions and want a snug shoe. Got these for my daughter and they are fantastic! Sound is great! They run true to size and their sound is solid! Highly recommended!! My daughter's studio loves this tap shoe. The older students use it in competitions and has a great sound. My daughter is just starting advanced tap and she wanted to get used to the feel of this tap shoe like the older girls use. I purchased these for my daughter who is taking college tap classes. This is the shoe her tap instructor recommends. The first pair we ordered ended up being too small! We then ordered a half size up which she says is fine, a bit more snug than she expected in the toes (but she felt that another half size up would be too big). These seem to run a bit short in the toe from what I've read online. She is considering taking them in to a shoe repair place to have them stretched in length (this is what some other dancers have done). She says she LOVES the sound they produce but she's still trying to get used to the less flexible sole and how it affects her timing. She feels that the timing issue will improve as she gets used to the shoes and breaks them in. My 16 year old daughter loves these shoes. They are sturdy and comfortable and look like they will hold up well in class. The tap sounds are wonderful! She is usually a size 7.5 and her feet run wide, so after reading the reviews I ordered an 8.5 and they fit perfectly. My 15 year old daughter is in her 13th year of tap lessons and dances competitively in a tap trio. She loved her old capezios, but it was time to move up to a more professional tap shoe. The Jason Samuel Smith was reasonably priced for a professional shoe and after research and consultation with her tap teacher, we decided to order them. I read all the reviews, and ordered one size larger than her capezios (she is a 6 street shoe, a six in capezio and a 7 in this shoe). She LOVES them. She immediately noticed a significant difference in the quality and comfort of this shoe over her old ones. The 7 fits her perfectly and there doesn't seem to be any problems with needing to "wear them in". They are a bit heavier than her other shoes, but not as heavy as we thought they might be after reading reviews. She will be able to wear them to her competitions almost right out of the box with few timing alterations. Fantastic buy, and we highly recommend. My daughter is 9.5 and has been dancing for 4 years. This is her first pair of Jason Samuel Smith tap shoes and they make all the difference in the world in her footwork! Her dance teacher/studio owner recommends these for the older more serious dancers, as do the choreographers who travel in to teach choreography. They are much more comfortable on her feet and run true to size for the most part. No blisters at all! The only adjustment she is having to make is that they are heavier so she's working on timing to perfect the routines due to the extra weight. They sound amazing....very professional quality. I am very pleased with these shoes. Very well made, very comfortable..no break in time. They sound wonderful. I wear 6 1/2 street shoe, and on recommendation I bought 7 1/2 and they fit perfectly. I know I will be enjoying these shoes for a long time. This is our third pair of Jason Samuel Smith Tap shoes. The only reason we have to buy new is due to growing feet. My daughters dance team all wears them. Excellent shoe for the price. Well made and they sound great. You can easily pass down to siblings due to their good quality. I highly recommend..
OMG I love these shoes !!! I bought them last week and when I put them on i was in LOVEEEEE ! I literally walked around the house in these for like 5 days. But i definitely recommend these shoes, especially to more experienced tappers. I bought these for my daughter in December. She loves the sounds they make and says they are very comfortable. I like the durability of the leather sole. Would not recommend for an inexperienced dancer or a child whose foot is still growing. Bought for my daughters and the shoe is a great fit, good quality and shipped in timely fashion. So comfy yet so solid, best shoes I have ever worn in my 21 years of tapping. order !/2 size or full size up? I am trying to decide whether to go up a half size or full size. I wear a 6M in a street shoe consistently. I don't have a particularly wide or narrow foot. I have pump tap shoes both in a 6.5 and 7 in different brands. I have a pair of Block split sole tap shoes in 7.5 that were passed onto me that are too big with two pairs of socks. I have a Block jazz shoe that advised to go up a size that is too big. I have ballet slippers that I went up the max recommended size and they are slightly too small. I mostly have block shoes in ballet, jazz, character, and tap and I have learned that they can vary widely but when I find the right size they fit better than most. I realize there is no guarantee but can you advise as to whether to order 1/2 or full size up? I personally wear a whole size larger in this shoe. However, each shoe is designed differently and it is hard to estimate the sizing. If you have sizing issues you can always return the item within the allotted 30 days and purchase a new size. How does the fit of this compare to other Bloch tap shoes? I'm a 6.5 with a wide foot. In TapFlex I wear a 7. In Respect I purchased a 7 but perhaps could have gone with a 6.5. 7 fits fine though. The sizing guide for this shoe recommends ordering 1/2 - 1 size larger than street shoe size. Please refer to the sizing guide listed under the product information. For further assistance, please contact our customer service department at 1-800-328-7107. Does this specific style fit people with a wide foot better than Bloch's split sole? I had worn Bloch split sole tap shoes almost my whole life until I purchase a new pair about two years ago. They never really stretched out to fit comfortably so I had to settle for a full sole Capezio instead because they feel wider (I am an instructor now and need the full sole for support). 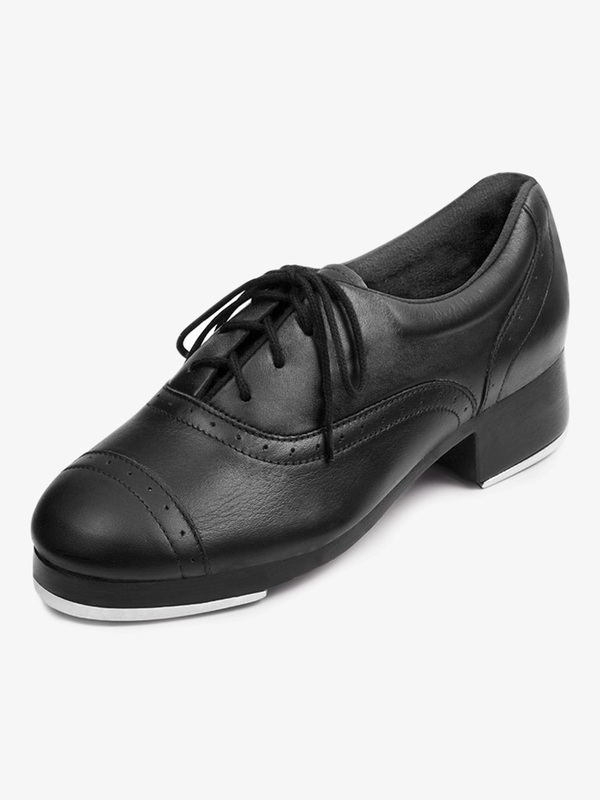 I really love the look of these tap shoes and the reviews are great...but I am worried they are going to be too tight. Most styles of Bloch tap shoes generally have the same width. This tap shoe will have a similar width to the Bloch split sole tap shoes. Please contact our customer service department at 1-800-328-7107 for further assistance. how well do these fit narrow feet? Because this shoe has laces, as opposed to being a slip-on, you will be able to adjust the width of the shoe to a certain degree. If you find the shoe is a bit too wide, you can also always wear them with socks. It is only offered in medium, but the laces will allow the opportunity to loosen or tighten the shoe. What are the two, black plastic-like items with slits in them that comes in the box for? They are non-slip pads that can be added to the bottom of the shoe to assist in resistance against the floor and prevent you from sliding. what is an acceptable alternate for this shoe until more sizes come in? Depending on the sizes needed, I would recommend style S0361L by Bloch, or CG55 by Capezio. Please contact Customer Service if you would like assistance placing an order and confirming inventory. As of right now we do not have an exact date on when these will be arriving.